Vietnam Airlines will have 583 more flights to meet rising travel demand of Vietnamese people who want to get back to their families across the country for celebrating the Lunar New Year holiday, or Tet, in early February. The flagship carrier will run the additional flights from January 18 to February 20 on the 10 major routes having strong air travel demand, with more than 100,000 seats to be made available. This is the airline’s second announcement of its domestic flight frequency increases in just more than one month prior to the nation’s biggest holiday. There will be 307 services between HCMC and Hanoi, or around 63,000 seats for the north-south route in the period, an increase of a staggering 41% compared to normal days and 8% from the same period of last Tet. The 129 extra flights for the HCMC-Danang route from the 15th day of the twelfth lunar month to the 18th day of the first lunar month provide 26,820 seats to the market, up 35% over the same period of last Tet and 24% over normal days. The SkyTeam member airline said it would serve more flights at night to ease operation and traffic congestion at airports during the holiday. A week just before and after the first day of the lunar calendar, it will operate round the clock to meet any sudden surge in demand. To keep air tickets from the black market, the airline will sell seats on the extra flights on the announced days, including December 20, January 3 and 17, mostly based on a demand-and-supply basis. The one-way tickets excluding airport and value-added taxes start from VND1.818 million for economy-class seats and VND3.35 million for business-class seats for flights from HCMC to Hanoi, Haiphong and Vinh. The respective fares are from VND2.272 million and VND3.85 million for Can Tho-Hanoi services and VND1.181 million and VND2.1 million for flights from Hanoi to HCMC and Danang. 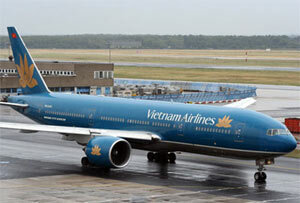 The airline called for passengers to book seats on its flights during the family reunion season at its ticketing offices and certified agents, whose addresses can be found on www.vietnamairlines.com. They are advised not to pay any extra fees that are not airport and VAT rates. Vietnam Airlines also requested passengers to carefully check their issued tickets and types of seats as well as ask the seller for receipts. The carrier warned it would impose heavy fines on those agents in connection with violations such as speculation and charging higher fares and more fees. The airline asked holders of confirmed tickets to be present at airports three hours ahead of departure to complete necessary procedures and encouraged them to use its web check-in service to avoid having to queue in long lines at airports during peak hours of air travel within Vietnam. In November, the airline announced a 44% increase in frequencies for the HCMC-Danang service and 57% for the HCMC-Hanoi run for Tet from normal days, with a combined 10,200 seats a day for single directions on these routes. But these seats have been snapped up. At last Tet, the airline operated less than 1,000 more domestic flights on the main domestic routes between Hanoi and HCMC, and HCMC and Danang to transport passengers home for family celebration before the national holiday and back to work after that.